Tom DeMaat holding two whitefish. 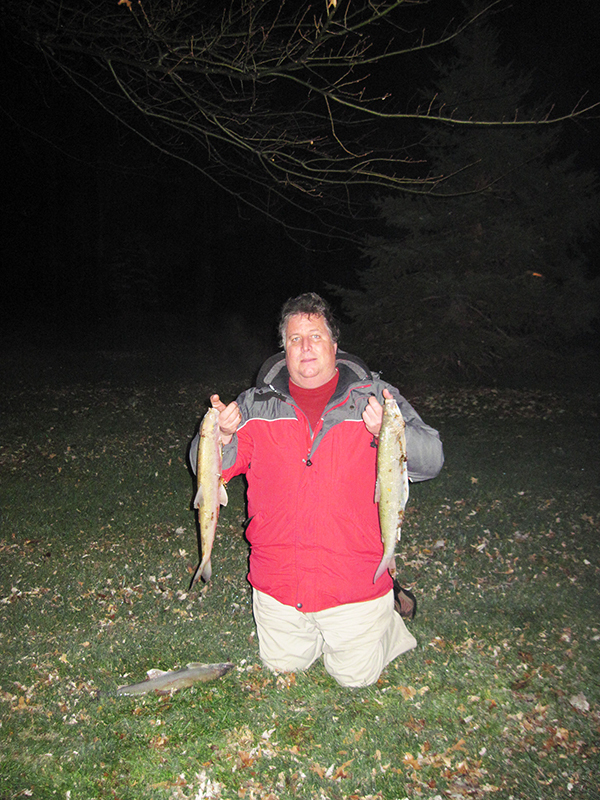 Late November and into December is an excellent time for whitefish and Menominee on the piers of Lake Michigan. Muskegon, Grand Haven, Port Sheldon, Holland, Saugatuck and South Haven are top piers starting in November and lasting through the winter. Fishing in the dark is best but cloudy days with a chop will produce fish. In addition to these connecting waters, we have some dandy inland lakes. Most are up near Benzie County such as Crystal Lake but don’t forget Higgins Lake just north of Houghton Lake. “Fishing conditions can be tough but the action rewarding,” said John Barr, a regular on the after dark whitefish crew. On top of the weather conditions these fish bite soft. Normally the best action takes place on the inside or channel side of the piers. The first wave of whitefish feed heavily on the eggs from the king salmon. As the water cools and the steelhead move in some anglers switch to skein in hopes of catching both. Most whitefish anglers use a single egg when chasing this delightful and wary fish. Single eggs from a female steelhead are the best. An egg sinker with a small orange or red bead just above a barrel swivel is the basic technique during daylight hours. A number 8, 10 or 12 egg hook tied to a leader completes the rig. The ideal day has a chop similar to the perfect walleye day. The length of the leader is based on the size of the waves. Flat seas require a 6 to 8 foot leader. Two-foot waves work best with a 3-4 foot leader. Anything over 4 foot swells and a 6-inch leader works best. Anglers need to hold their rods or keep a very close eye on the tip. One tap is about all that you will get before your bait becomes dinner. Savvy pier anglers often paint their rod tips with glow in the dark paint or some bright color for easier visibility. A seven to eight foot rod with a fast tip and a decent backbone works great regardless of the technique. The Muskegon pier generally sees action before the other piers in West Michigan. The action starts north and continues south with the cold water. Safety reasons dictate not to fish when the waves are crashing over or if they become icy. Hopkins spoons are a favorite at night with the anglers. A long rod is used and most of the action is taken while vertically jigging. The smallest spoons that you can find work the best. Other good choices would include Kastmasters, Rapala and if you can find them the Zip Spoon from Blitzer Creek. We make our own using the Do It Molds and add glow in the dark tape with a red eye! The key is to tick the bottom and lift up 6-12-inches. Drop down and repeat while paying very close attention for a hit. Snagging fish can be a problem with spoons and all snagged fish must be released. There is no size limit on whitefish or their cousin the Menominee. The diehard anglers pull a shopping cart onto the pier. Most anglers mount PVC rod holders and carry a five-gallon pail. Inside the pail anglers carry tools and small plastic tackle boxes with all of required gear. Parking is provided near the piers at all of the ports except Saugatuck. Saugatuck requires a mile walk from the Oval Beach in Douglas. Muskegon pier is the longest with a lot of riprap rock along the pier. South Haven pier borders the downtown district with plenty of parking and good lighting. There are few fish that can match the quality of eating on a grill or in the broiler better than a whitefish. Some of the piers have a cable that you can lean over and not worry about falling in, and on others you need to pay close attention. Remember to bring along a long-handled net or you will be lying on your belly sucking in Lake Michigan water while trying to net a fish. Been there and it was not fun. Give whitefish a try before the ice fishing season starts.